Jeth and I decided that this summer, we are going to challenge ourselves (Chopped style), to cooking our Saturday breakfasts with food bought (mostly) from the farmers’ market. Our local Saturday morning market isn’t huge, but has stands from farmers in WV, PA, and MD. I don’t have a great track record when it comes to eating local, but the quality of the meats, cheeses, veggies, and baked goods at the farmers’ market is excellent, and we would like to take better advantage of such a great resource. Today was our first day of this “challenge”. Since it is still early in the year, the stands were full of leafy greens and herbs. We picked up some garlic scapes (ever heard of those? We hadn’t), a big bag of spinach, and some soft goat cheese. We kind of planned our meal as we browsed and saw what looked good. 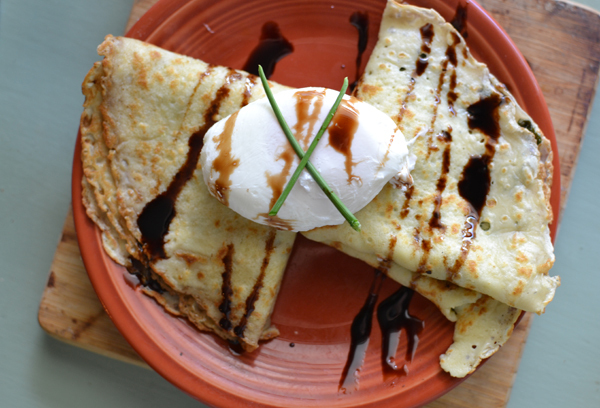 We settled on crepes with a garlic scape/wilted spinach/chevre filling, topped with a poached egg and balsamic reduction. Not everything came from the farmers’ market, but it’s a start. In other news, I learned how to poach an egg today. Not bad for a first try! Have you been shopping at farmers’ markets or eating locally grown/raised foods this summer? What would you have made with these ingredients? Tags: breakfast, eating local, recipe, spring. Bookmark the permalink.